I sure am glad that rain finally stopped! Us pups can get outside and run, chase squirrels, and play! After playin’ the other day, my Lady told us we had to report to taste testin’ duty. Did she say ‘had to report’? Since when did we not want to report for our taste testin’ job? WOOF! What she didn’t tell me was we that she had a surprise for us! When she called us all to report, we saw a big ole box sittin’ there. And, low and behold, it held our favorite bully sticks – Best Bully Sticks dog chews! Our eyes got big, tails went whippin’ back and forth like windshield wipers on high, and the drool went to rollin’! Yea buddy! I was actually shackin’ in my skin to get a hold of one them big dog chews! Of course my Lady had done checked em out, read the package up and down and was mutterin’ somethin’ ’bout natural and digestible. I’m sure glad she done all that readin’ ‘fore we knew what she had cause I just couldn’t wait much longer! I’m gonna go gnaw on mine a while and let her do the s’plainin’! How do I put this? My dogs LOVE LOVE LOVE to chew! Oh boy! Do they love to chew?! Yep! If I don’t keep the pups, especially, in appropriate chews they have been known to tackle a few furniture legs! However, they LOVE LOVE LOVE their bully sticks and thankfully those calm the chewing attacks! I love giving my dogs Bully sticks to chew as much as they love to get them! Why you ask? They’re all natural, they break down well, and they don’t have the potential to cause blockages like rawhide chews do. Our favorite bully sticks? Hands down, it is an all paws up for Best Bully Sticks! Neither I, nor my dogs, could be happier when an order comes in! If you haven’t heard of them, let me tell you a bit about them. Then, I will show you some pics of all the pups chowing down on their favorite braided Best Bully Sticks! When it comes to chews, I am sure my dogs would love rawhides. However, I don’t! Here’s why. In my opinion, they’re dangerous! Rawhides are extremely difficult to digest. In fact, they only break down ‘somewhat’ in a dog’s digestive tract. That means that when a dog chokes down an almost full size rawhide chew, they’re setting themselves up for the possibility of an obstruction. That’s bad! It could mean surgery or even death! Then, even if there are no blockages, those chews can cause painful evacuation due to the size of the pieces. To me, they’re not worth the worry or the misery! Enter bully sticks. 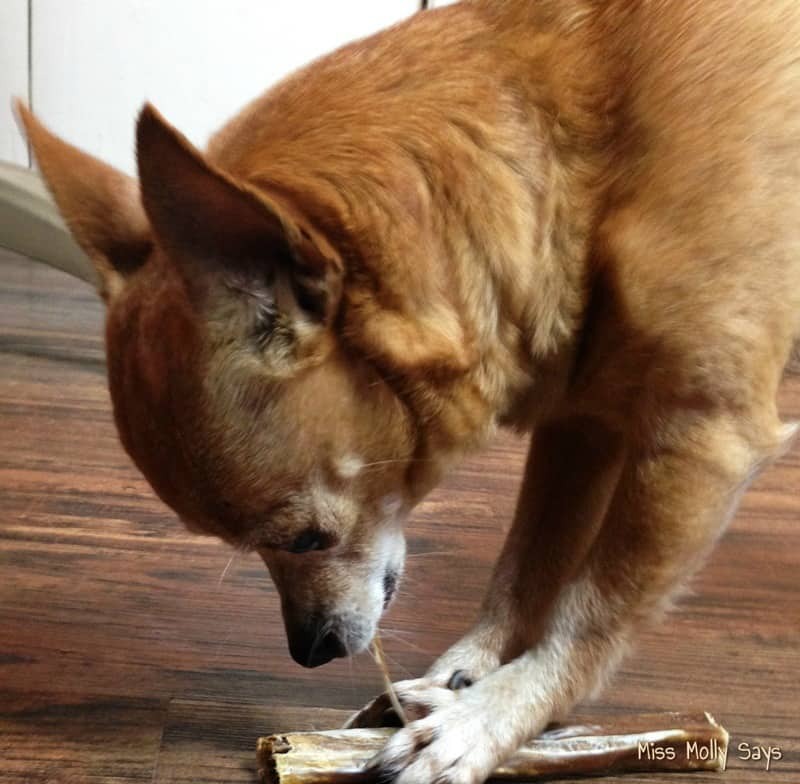 Bully sticks are 100% natural, digestible, and safe. And since my dogs can’t get enough of them, it’s a winner for everyone all the way around. With these all-natural chews, my dogs get hours of chewing pleasure, and I don’t have the worry of keeping my eye on them. Unlike rawhides, I don’t have to take away my dogs’ bully sticks when they’ve been gnawed down to a small piece. Best Bully Sticks are a Hit with the Pack and Mom! We have had the chance to try out an assortment of bully stick dog chews from Best Bully Sticks, and both my dogs and I have been thoroughly enjoying them. Their chews are all-natural, and come from grass fed beef. That means that my dogs are happy with their chews and the animals that the chews came from also had happy lives. As an animal lover, that’s a big deal to me. Best Bully Sticks has a great variety, as well. Not only do they have the standard chews, but they also have braided sticks as well as an assortment of odor free sticks. I REALLY like the odor free ones! Oh Yes! It’s the quitest time I have had all day! 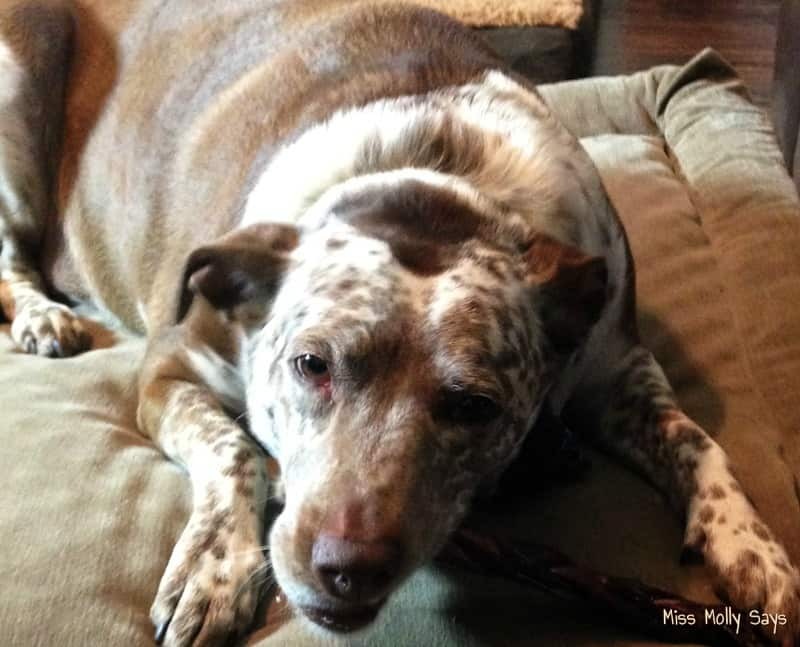 All the pups are happy and busy doing their favorite past time – chewing on a bully stick! 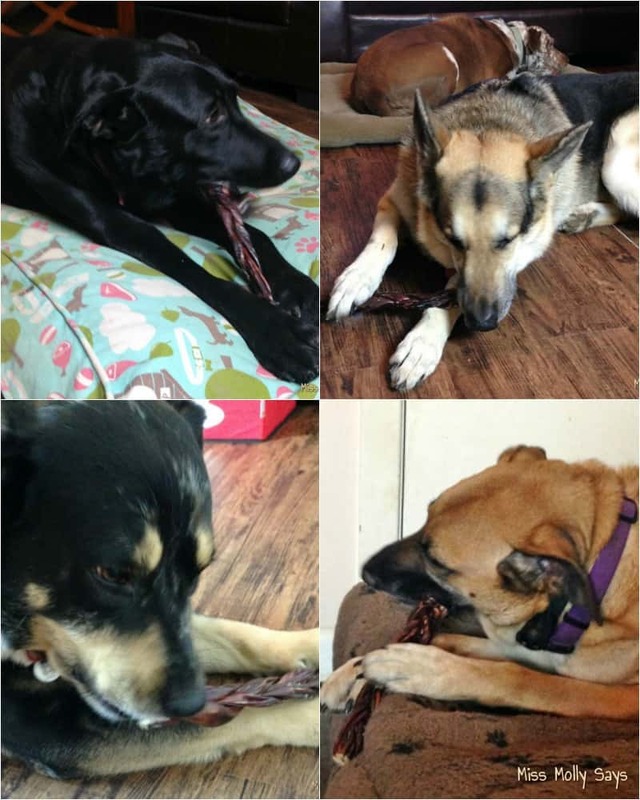 Today, the pack is munching on the braided bully sticks from Best Bully Sticks! I think the braided ones are their favorite because they last longer! Miss Molly took her BestBullyStick back in the corner bed to eat. She wasn’t taking any chances of the others finishing and then coming after hers! She likes to eat hers slowly and savor it to the fullest! These fun all natural Lamb Bites Dog Treats from Best Bully Sticks were light and crunchy. They are also a low-fat snack which is great for training! The lamb bites are made from Australian lamb with no chemicals or artificial ingredients. My senior girl and the rambunctious pups loved these bite size morsels! They are even small enough that our little chihuahua could eat them easily! Did I say duck fillets? YES! My pups adored the Duck Fillet Dog Treats! These tasty chewy snacks are a protein-rich dog treat made with antibiotic-free, hormone-free duck. They are similar to a chew, but have a jerky consistency making them beneficial to canine dental health. Unlike rawhide chews, Duck Fillet Dog Treats are 100% digestible and contain only 2 ingredients: duck and vegetable glycerin – NO corn or grain fillers! They are simply a great natural dog chew! If your dogs are avid chewers, I encourage you to give bully sticks from Best Bully Sticks a try. Not only does they help promote healthy gum and teeth, they give them something appropriate to take out that chewing action on! Best Bully Sticks dog chews are super high quality, all-natural, and so much safer than rawhides. 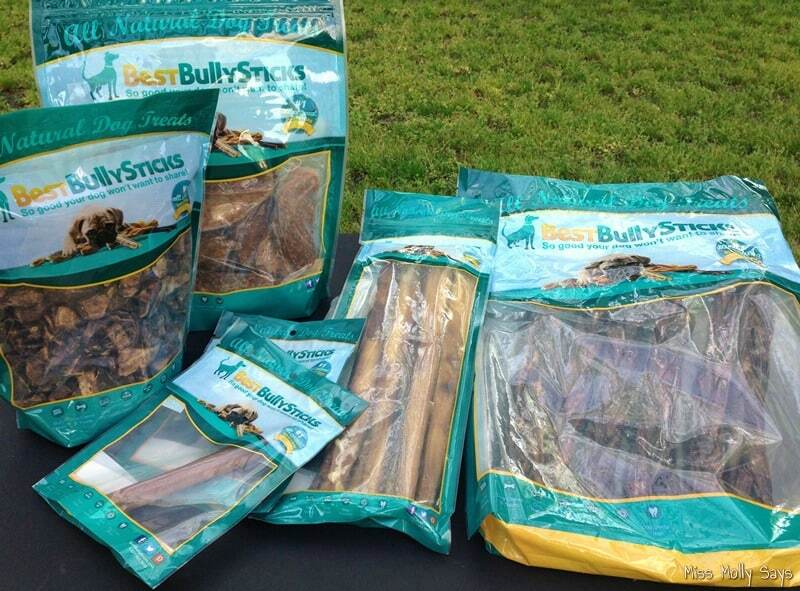 And, because you can get them in odor free varieties, both you and your dogs can enjoy bully sticks in equal measure! These are great for my dogs, I don’t give them rawhide since they tend to choke on it. My pups loves best bully sticks. 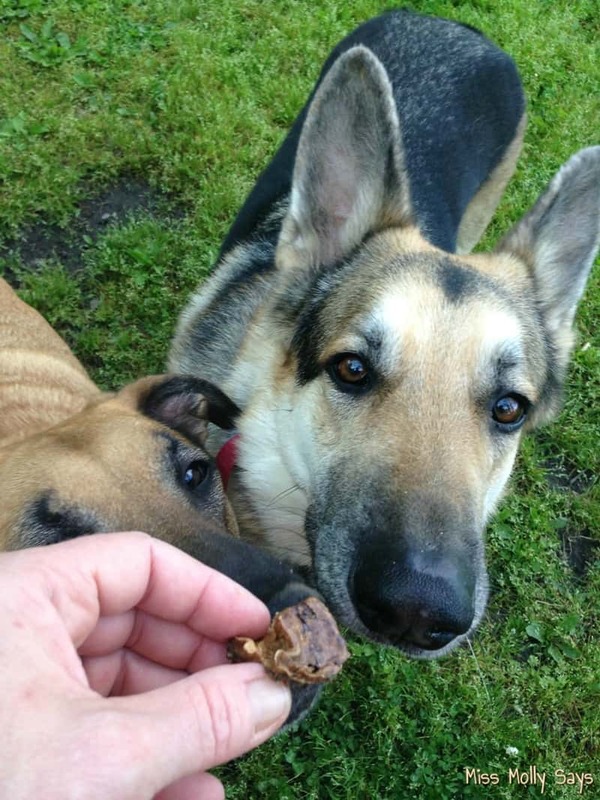 I love the variety of treats and chews they have and the pups have loved every thing have ordered from Best Best Bully sticks especially the tripe sticks and the bonbons. I’m preparing an order to send! I did not know they were available in odor-free, I will definately look for them ‘cos they are stinky! I am excited to have my dog try these. My Poagie loves bully sticks! I do not buy them too often because they are expensive! My 3 black labs have a rawhide chew every night, I didn’t realize they were bad for them. . Being as these are all natural I am sure my dogs would love, what am I talking about, they love everything that fits into their mouth. I was a little hesitant about trying these for my dogs, but when I finally did, they really loved them. I was up to five Coonhounds, which make it a bit more difficult to afford to get these for them on a regular basis, but I’m down to three (my deaf hound girl, Ran, passed last year from an autoimmune disorder and my senior girl, Suki, passed because of her age)., so I’m hoping to be able to get these for them more often now. The review on Bully Sticks was wonderful. I am 51 year old that never owned a dog until last year. I found Benji on the side of the road and his sweet little eyes told me to pick him up and take him home. I took him to the vet and they said his jaw had been broke, ribs broke, and malnourished. Me not knowing anything about dogs it is very much a learning curve. Benji is now my “baby”. He is so spoiled. All I have to do is rattle the begging strip bag and he comes a running. Then when I hold it out he starts dancing. I tried rawhides and had to stop, he would throw-up white stuff and they only thing I could figure was he was allergic. Now that I read your review, I now realize that the rawhides were either getting stuck in his throat or not very digestible. Thanks for the insight. So very true! Rawhides are dangerous!!! From vomiting, to Heaven forbid, it getting lodged – it is best to leave them alone! I would kind of figure that bigger dogs would like these treats more. They look tasty for the bigger dogs. I don’t think I would catch my small dog ever eating this but I don’t know really. I have to say I agree 100% with your review: these are honestly the best chew wristbands down! I love that the chews are 100% natural and digestible. My Petey has a sensitive tummy! These sound very tasty. I know our pups would love them! I think my dog would like the braided bully sticks. They all look great for dogs who love to chew. I think these sound like a great alternative for great dental chews. I love that they are all- natural and easy to digest which makes them safe for my baby (doggie). My 3 love bully sticks. I love giving them chews that are safe and digestible. Looks like you scored quite the stash there! Yum! Our dogs LOVE bully sticks. I definitely agree with you on the rawhides. I’m glad your dogs love these bully sticks! Thanks for the review. Rocco LOVES these and so do I! They keep him occupied for hours! Those lamb bites look great for training. I’m always looking for new training treats! Two of my three are also crazy chewers and I completely agree with you about rawhide so we are always on the hunt for alternatives. The bully sticks and the treats sound fabulous! Kilo just loves Bully Sticks and so do I. These look fabulous and so do the treats. I’ll have to look for them- low fat and yummy – we do lots of training. These chew sticks looks so amazing for the dogs to eat mine would just love them . No grain or gluten is so important for my dogs too. My dogs would love these and being odor free is definitely a bonus as far as I’m concerned! These look like my dog would love them. I like that they are all natural and completely digestible. Nom Nom Nom. So tasty!! Your dogs really got spoiled with this review! 🙂 All 3 of these look great. I’m glad that there is an alternative to rawhide because I have heard so many negative things about rawhide. Bully sticks, on the other hand, seem to go over really well with the dogs that try them and they are healthy! Echo loves bully sticks so I will definitely have to check into these! I am entering the giveaway for him as well! They are perfect for a teething puppy! These sound and look yummy. We haven’t tried them but will look for them and give them a try! OOOH Dexter is very interested in the duck fillet stick. I did not know bully sticks had a duck version. MMMMM! Their bully sticks and other treats sound much healthier than what our dogs currently get. We are very driven by price as my hubby is out of work. We want the best for our dogs though. Will look into these. Hoping we can fit them into our budget because we adore our dogs. Thanks for the great info. Our dog love bullysticks, and they are way better then rawhide! I am looking forward to trying this based on this fine review. I would like an alternative flavor line, so this is perfect. I love that these are safe for my dog. My dogs love lamb lung puffs and I’m sure that they would like lamb bites. I am anxious to try the Lamb bites for training. It is difficult to find small healthy tasty training treats. have different flavors to choose from’. I would love to let my dog give these a try ! These look good and healthy. Something my dogs would love. The pups love best bully sticks! But I have to keep an eye on Nala because she thinks all the treats are for her. ’Our furbaby would love these treats. I think my dog would love the bully sticks. She is a chewer and I have read so many things about rawhides that prevented me from ever giving them to her.